The 2018 Honda Accord gets dynamic new styling, a new set of turbocharged engines, and a host of standard driver-assist features. The new Accord offers more rear-seat room, more standard features, cutting-edge infotainment setup, and striking fuel economy in both standard and hybrid form. Honda Accord- one of the best bangs for your buck. I really love the safety features of the car. The car offers a five star safety rating. The Honda Accord has an excellent back up camera. The car also has collision prevention assistance and lane keep assist. The car also comes with a five-year hundred thousand mile warranty if any problems should arise. The particular dealer that I want to also gave me a competitive price for the vehicle that was easily negotiable. The car offers one of the best fuel mileage for the midsize sedan class. I have consistently been able to obtain over 35 miles per gallon with my driving. Also the car is able to get over 500 miles on one tank of gas on one tank of gas which prevents frequent stops to the gas station. My total fuel cost for one year was around $1200. The car has been really dependable and really reliable. I love the Honda brand because I personally feel that the cars are indestructible as long as you take care of them. The car offers plenty of rear seat legroom and has plenty of trunk space for all of your belongings. My favorite Honda so far. I have owned many Honda Accords but this 2018 model is the best one by far. The safety features including the active cruise control and lane keep assist are amazing. They really help during my commute when I am super tired and probably shouldn't be driving. The heads up display is awesome too. I love having a digital speedometer on the windshield. The heated front and rear seats is super nice and the cooled front seats are a must in northern California summers with black leather interior! I got the black edition Honda so I have the black 18 inch rims which look really awesome with the pearlescent white paint color and the dark tint I did on all the windows. 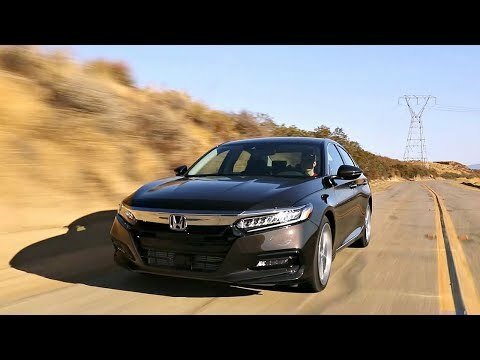 2018 Honda Accord review and recommendation. The vehicle is fairly spectacular. It is very comfortable: the driver's seat is fully adjustable. The car has a very good pickup (4 cylinder). The interior is done very well with all of the moldings and coverings very will put together, the car is equipped with all of the available safety features, including safety stop, lane veering notification, rear camera and blind spot notification, the ride is noticeably quieter than previous Hondas. It comes with excellent floor mats and trunk mats. After 8 months service, not one deficit or problem has developed. The exterior is sleek. The Bluetooth connection to cellular phones was easy to implement. Honda (American Honda Motor Co.) is recalling certain 2018 Honda Accord and 2019 Honda Insight vehicles. In certain scenarios, the back-up camera center display may not function properly. As such, these vehicles fail to comply with the requirements of Federal Motor Vehicle Safety Standard (FMVSS) number 111, "Rearview Mirrors." If the rearview camera display does not show what is behind the vehicle, it can increase the risk of a crash. Honda will notify owners, and dealers will reprogram the display audio unit software, free of charge. The recall began October 30, 2018. Owners may contact Honda customer service at 1-888-234-2138. Honda's numbers for this recall are K2G and V2F.